Deaf Education – School for the Deaf or Regular School? Since I started my formal education at the age of 7 in a school for the deaf in Russia, I wanted to publish the article today to celebrate Knowledge Day, the day when the school year traditionally starts in all schools in Russia and many other former Soviet republics annually on September 1st. It is also the First Bell for the incoming class of first graders. Around the USA, the start dates of school year vary based on regions – in some areas it already started a few weeks ago while in other areas will start next week. It’s stressful enough for parents of non-disabled kids to prepare them for school, it’s even more overwhelming for parents of deaf and hard of hearing kids. They are faced with options of whether to send them to a school for the deaf or to a regular school with hearing kids. There are also different types of schools for deaf – some are focused on sign language while others are focused on listening and speaking. Some regular schools have deaf programs while other regular schools have only one if not a few deaf kids and different types of communication access services are provided depending on needs and abilities of deaf students including but not limited to: FM system, live captioning, oral interpreters, sign language interpreters, cued speech transliterators. My experience with education from the grade school to graduate school was very diverse – from attending a school for the deaf using Russian sign language to attending mainstream schools (where everyone speaks Russian) and having no formal communication services at all to attending college and graduate school (where everyone speaks English) and finally having formal communication access services via live captioning in English and American sign language interpreting services. It’s not possible to discuss everything in one post, so I will share some highlights. It was originally planned that I attend a regular school, but after some consideration my family decided to send me to a school for the deaf instead. Since my maternal grandparents lived close enough to walk to a local school for the deaf, I moved with them and visited my parents on weekends. I remember my first day at the school for the deaf and being overwhelmed with everyone using Russian Sign Language that I could not understand. After becoming deaf from meningitis at age of 2, I learned to speak again and to lipread as well as to read, write, count to be ready for school. However, my vocabulary and expressive language was limited. The school I went to was using “Rochester Method” by having deaf students use voice and finger spell in Russian in classes and sign to each other outside of classes. We also worked with a speech therapist after classes and had to wear those bulky hearing aids (as shown on the picture on top) which many of us hated (including myself – I didn’t use them much until I got a BTE version which I loved and started wearing regularly). Since I didn’t know sign language, I was learning and practicing it every day on my way from home to school and back. After I started using fingerspelling and sign language, my language skills went through the roof and I was picking up very fast. However, the quality of education in that school still left a lot to be desired. After spending only 4 months in the first grade, I was promoted to the second grade where I spent another 4 months. For my second year, I was promoted to the third grade and after New Year’s I was moved to a parallel class (with another teacher) that was more “advanced” where I spent the last 2.5 years. The teacher in that class was the best in the school and I was very fortunate to have her teach me to better express myself in my own words (using both voice and fingerspelling), to write in proper Russian grammar, and to become a voracious reader. Sadly, that teacher also had a very difficult personality that often made me come home crying and dreading going to school every day. It was one of the major reasons why I left that school for the deaf. Around that time I also learned that education in regular schools was much better than that in the deaf school where teachers had low expectations from deaf students. My family was pleased that I did well in school and got good grades, but I did not feel challenged enough in the school for the deaf. I remember asking my grandmother to be transferred to a regular school just right across her home because I wanted to get the same education as hearing kids. She told me that I would not be able to understand people there and explained to me that lipreading her would not be same as lipreading hearing teachers and students who talk very fast. Hearing aids were of little benefit to me in terms of speech discrimination and I got a cochlear implant only as a college student. My deafness still didn’t stop me from pursuing my dream of attending a regular school with hearing kids and do many things like them. It came true when one summer my grandma announced to me that I would be transferred to a regular school across her home which I could not believe at first. She told me that she spoke to a superindentent there (whom she knew from working with her in past) to try me for a year and see how well I will do there. I was so excited because it would also mean that I would not only get the great education but also have the opportunity to learn foreign languages and also to play piano! It was not easy for me to navigate education in regular schools for 7 years because I missed a lot in classes and learned mostly from textbooks. I was very fortunate to have all teachers who were very accommodating in any way they could and willing to answer my questions during their office hours. My family also helped me at home. No formal communication access services like live captioning or sign language interpreting were offered at all. I had to work much harder than my hearing classmates to be a straight-A student and to graduate from high school on top of class. Also, my mother wrote verbatim notes using paper and pen for 2 classes that I recorded (during my last 2 years of high school) – Literature (because I could not participate in discussions) and Art History (because it was a new class without a textbook). 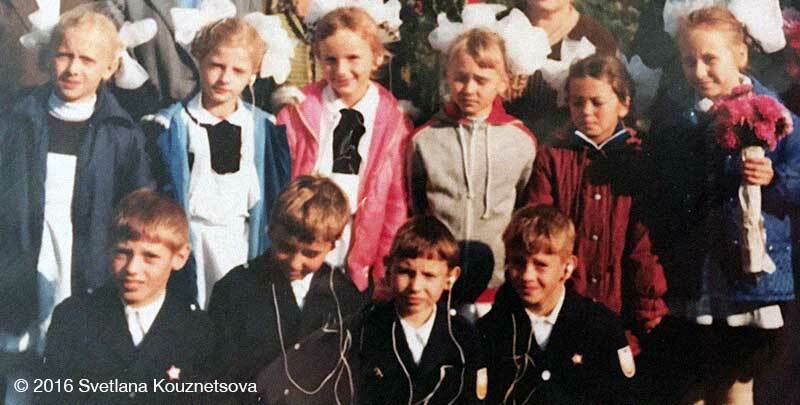 I had to juggle on average of 15 subjects every week – education in Russian schools is very rigorous. I also played sports – volleyball and table tennis – which not only allowed me take some break from stressful school schedule, but also to better bond with school kids because not much communication is needed to play sports. Despite difficulties, I do not regret my decision to attend regular schools (even if I was not on the equal footing with hearing peers in terms of accessing aural information) because I got a great education and especially had the opportunity to learn English and French as foreign languages. Mastering English as a foreign language and attending American universities were not even in my and my family’s minds back then! I would not be where I am now if not for my grandmother who made my wish to attend a regular school come true – from where I started my journey in the hearing world as a deaf person. She was a math teacher working in different schools and had many professional connections. In my time, deaf people in Russia were not allowed to attend regular schools, let alone get formal communication access services. When attending a college and a graduate school, I finally had formal communication access services via sign language interpeters and live captioners. However, it was not without problems. I didn’t know any ASL to benefit from interpeters and sadly was denied C-Print services that greatly benefited me as an oral deaf student during an orientation program for incoming deaf freshmen. I felt like having a deja-vu when I could not understand any RSL during my first day at a school for the deaf in Russia. I felt overwhelmed again not understanding deaf students signing – that time in American sign language. I and many oral and cueing deaf students sadly were forced to use sign language interpreters in that university to the point that some decided to go to other universities while others filed several complaints against the university (after I graduated from there). I had no choice but to stay till graduation. 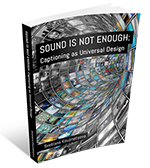 The other university where I attended for a graduate program was more willing to provide a live captioner to me, but they knew only one provider and there’s more scarcity of quality live captioners than sign language interpreters. It was also during undergraduate years that I learned about ADA and other disability laws and started to realize about rights of deaf and hard of hearing people for communication access services that better fit their needs and not limited to just ASL interpreters. It was quite an experience for me and my family navigating through various types of education systems and being pioneers during the times where there were no strong disability laws to allow deaf students to be mainstreamed with hearing peers and still fighting for proper access even with the laws being around for many years. While it was possible for me to attend classes without communication access services (or not being provided with the right type of access as in being forced to use interpreters when I barely knew any ASL) and at same time make good grades, it is not something that deaf students should experience through because it doesn’t put them in the equal footing with hearing peers in terms of full and equal communication access. There were both ups and downs in my education, but I would not change it for anything – though I wish I had full communication access services in middle and high schools. It was a very unique experience for me to try different types of schools and to speak different languages and to use different types of communication access services. It made me the person I am today. My education didn’t end with graduate school. I also took courses for certifications and have been attending workshops, events, conferences where I use live captioning or interpreting services or both depending on a type of an event. I would like to advice to parents of deaf students that deafness should not prevent them from getting the type of education they want and that any communication method can be useful to them – let it be listening and speaking or sign language or cued speech or captioning or a combination of several methods. I was one of many deaf people who spent certain periods of education in regular schools without communication access but it didn’t prevent us from getting good grades or being on a honor roll. It was around times when hearing aids were not advanced enough for speech discrimination and cochlear implants were not available or just started to used. Having ability to hear does not guarantee good grades or a honor roll or even ability to learn foreign languages. There are many kids with normal hearing who do not do well in school. I even helped many hearing students with homework despite having less access to aural information than them! Also, there’s nothing wrong with attending a school for the deaf if it is something that a deaf kid wants. I believe that more options need to be offered for deaf students to attend a school for the deaf or a regular school with hearing peers using formal communication access support services or a regular school with a deaf program. Not only good education is important, but also good social life. If you are an university or an educational organization and want to improve communication and information access to your deaf and hard of hearing students, contact us for consulting and training as well as for presentations if you are looking for an experienced deaf speaker. captioning, CART, communication access, cued speech, deaf, education, FM system, hard of hearing, sign language.